Why did the CBO change its Social Security projections? Joyce Manchester, the Chief of the Long-Term Analysis Unit in CBO’s Health, Retirement, and Long-Term Analysis Division, blogs on how the CBO came to view longevity differently than the Social Security Trustees, and how those changes translated into a more pessimistic forecast for Social Security’s future finances. Check it out here. a median real return of 4.45 percent, the average used by plans in 2012.
amortization approaches produce inadequate contributions. Paying 100 percent of the ARC and using more robust funding approaches leads to near full funding by the end of the period. However, even under these more favorable scenarios, the variability of returns still poses risks of funding shortfalls. This brief is available here. The Michigan Retirement Research Center has released a new working paper, titled “The Social Security Windfall Elimination and Government Pension Offset Provisions for Public Employees in the Health and Retirement Study” by Alan L. Gustman, Thomas L. Steinmeier and Nahid Tabatabai. This paper uses data from the Health and Retirement Study to investigate the effects of Social Security’s Windfall Elimination Provision (WEP) and Government Pension Offset (GPO) provision on Social Security benefits received by individuals and households. WEP reduces the benefits of individuals who worked in jobs covered by Social Security and also worked in uncovered jobs where a pension was earned. WEP also reduces spouse benefits. GPO reduces spouse and survivor benefits for persons who worked in uncovered government employment where they also earned a pension. Unlike previous studies, we take explicit account of pensions earned on jobs not covered by Social Security, a key determinant of the size of WEP and GPO adjustments. Also unlike previous studies, we focus on the household. This allows us to incorporate the full effects of WEP and GPO on spouse and survivor benefits, and to evaluate the effects of WEP and GPO on the assets accumulated by affected families. Among our specific findings: About 3.5 percent of households are subject to either WEP or to GPO. The present value of their Social Security benefits is reduced by roughly one fifth. This amounts to five to six percent of the total wealth they accumulate before retirement. Households affected by both WEP and GPO lose about one third of their benefit. Limiting the Social Security benefit to half the size of the pension from uncovered employment reduces the penalty from WEP for members of the original HRS cohort by about 60 percent. * About 3.5 percent of households in the Health and Retirement Study (HRS) are subject to either the Windfall Elimination Provision (WEP) or Government Pension Offset (GPO) provision, features of the Social Security benefit determination process that limit the benefits of employees who worked in jobs not covered by Social Security, but who are also are eligible for Social Security benefits. * The present value of the Social Security benefits of affected households is reduced by roughly one fifth, amounting to five to six percent of the total wealth affected households accumulate before retirement. * Households affected by both WEP and GPO lose about one third of their benefit. * Limiting WEP adjustments to Social Security benefits to half the size of the pension from uncovered employment, as in current law, reduces the penalty from WEP for members of the original HRS cohort by about 60 percent and substantially affects any interpretation of the law’s impact that is based solely on the provisions of the adjustment to the Primary Insurance Amount formula (PIA) under WEP. The Congressional Budget Office released on Tuesday its annual Long Term Budget Outlook, which includes updated projections for the financial health of the Social Security program. And those updates are significant – CBO projects Social Security’s 75-year deficit will equal 3.4 percent of taxable payroll. That means that an immediate and permanent 3.4 percentage point increase in the current 12.4 percent Social Security payroll tax would be sufficient to keep the trust fund solvent for 75 years (though not beyond). Last year, CBO projected the long-term deficit at only 1.9 percent of wages, meaning that this year’s projections raise the shortfall by roughly 79 percent. 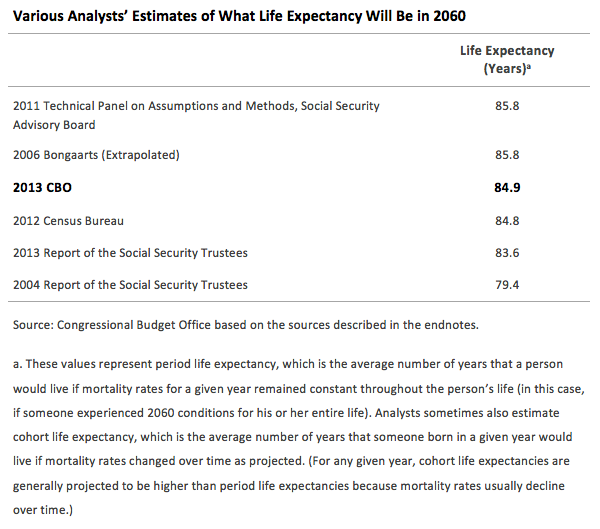 · Longer life expectancies: CBO projects slightly longer life spans than SSA, assuming life spans in 2060 of around 84.9 years rather than SSA’s 83.6 years. As a result, retirees will collect benefits longer. · Higher disability rolls: CBO projects that the ultimate disability rate will equal 5.6 individuals per 1000, versus 5.2 in previous reports. · Higher unemployment: CBO projects a long-term average unemployment rate of 5.3 percent, versus 5.0 percent in prior reports. The net result is a long-term Social Security deficit considerably worse than previously thought. None of this changes how large the Social Security shortfall will be. These, after all, are projections and only the future will tell how things will turn out. But for those who previously said that there’s no hurry to fix Social Security because the long-term deficit is small and easily managed, a near-doubling of that deficit should cause them to reconsider their positions. Update: Jed Graham of Investors Business Daily notes that CBO now projects that the combined Social Security trust funds will become insolvent in the year 2031, which would trigger across the board benefit cuts throughout the program. And Jed himself predicted that CBO would make this change. Check out his article here. Read more! "The Impact of a Retirement Savings Account Cap"
This paper provides an initial analysis of the potential financial impact on private-sector retirement benefits of the retirement savings account cap included in the Obama administration’s FY 2014 budget proposal. This cap would limit the amounts accumulated in specified retirement accounts to that necessary to provide the maximum annuity permitted for a tax-qualified defined benefit plan under current law. The budget proposal is targeted at a wide range of retirement plan vehicles; and, if enacted by Congress, the Obama administration’s proposal would be effective with respect to contributions and accruals for taxable years beginning on or after Jan. 1, 2014. This analysis finds that although a very small percentage of current 401(k) participants with IRA accounts have combined balances sufficient to be immediately affected by the proposed limit, over time (and depending on the applicable discount rates, whether a defined benefit pension is involved, and the size of the 401(k) plan) the impact could be much greater. Simulation results for 401(k) participants assuming no defined benefit accruals and no job turnover show that more than 1 in 10 current 401(k) participants are likely to hit the proposed limit sometime prior to age 65, even at the current historically low discount rate of 4 percent. When the simulation is rerun with discount rate assumptions closer to historical averages, the percentage of 401(k) participants likely to be affected by these proposed limits increases substantially: For example, with an 8 percent discount rate, more than 20 percent of the 401(k) participants are simulated to reach the limit prior to retirement. When the impact of stylized, defined benefit account assumptions are added to the analysis, the percentage of 401(k) participants simulated to reach the proposed limits increases even more: In fact, for 401(k) participants assumed to be covered by a 2 percent, three-year, final-average plan with a subsidized early retirement at 62, nearly a third are assumed to be affected by the proposed limit at an 8 percent discount rate. Additional analysis is performed for small plans (those with less than 100 participants) to assess the potential impact of eventual plan terminations if and when the owners and/or key decision makers of the firms reach the cap threshold. Depending on plan size, this may involve as few as 18 percent of the firms (at a 4 percent discount rate) or as many as 75 percent of the firms (at an 8 percent discount rate). "Retirement Plan Participation: Survey of Income and Program Participation (SIPP) Data, 2012"
This paper presents results from the latest Survey of Income and Program Participation (SIPP) data on retirement plan participation. SIPP is conducted by the U.S. Census Bureau to examine Americans’ participation in various government and private-sector programs that relate to their income and well-being. These latest data are from Topical Module 11 of the 2008 Panel, fielded from December 2011-March 2012. The SIPP data have the advantage of providing relatively detailed information on workers’ retirement plans, but they also have the drawback of being fielded only once every three to five years. By comparison, the Census Bureau’s Current Population Survey (CPS) provides overall participation levels of workers on an annual basis but does not provide information on the specific types of plans in which the workers are participating. The Bureau of Labor Statistics’ (BLS) National Compensation Survey annually surveys establishments’ offerings of employee benefit programs, including retirement plans; however, it has limited information on worker characteristics. The latest SIPP data show that 61 percent of all workers over age 16 had an employer that sponsored a pension or retirement plan for any of its employees in 2012, up from 59 percent in 2009. Workers participating in a plan increased to 46 percent in 2012, up slightly from 2009 (45 percent) but below 2003 (48 percent). The vesting rate (the percentage of workers who say they were entitled to some pension benefit or lump-sum distribution if they left their job) stood at 43 percent in 2012, up from 24 percent in 1979. This increase is largely due to the increased number of workers participating in defined contribution retirement plans (such as 401(k) plans), where employee contributions are immediately vested, and faster vesting requirements in private-sector pension plans. Defined contribution (401(k)-type) plans were considered the primary plan by 78 percent of workers with a plan. Defined benefit (pension) plans were the primary plan for 21 percent of workers. Primary plan is the plan type -- defined benefit (DB) versus defined contribution (DC) -- that retirement plan participants regard as their most important. The last section of the paper examines participation in, and contributions to, salary-reduction plans (401(k)-type plans). The workers in this study include those from both the private and the public sectors. "RRSPs and an Expanded Canada Pension Plan"
After their meeting in December 2012 at Meech Lake, Quebec, the federal and provincial-territorial finance ministers decided to put expansion of the Canada Pension Plan (CPP) and its sister program, the Quebec Pension Plan (QPP), back on the policy agenda. The idea of expanding the CPP is not new and, over the years, various individuals and groups have called for a more generous mandatory public pension system as a way to boost the overall retirement income of Canadians. With the global financial crisis of 2008-2009 and attendant decline in the value of retirement-savings portfolios, these calls have been renewed. Recent proposals to expand the CPP call for an increase in the mandatory CPP contribution rate (payroll tax) to help fund larger benefits. Unfortunately, the debate about expanding the CPP has downplayed the basic economic insight that increasing mandatory contributions to the CPP could displace voluntary savings. Failure to account for this tendency could lead one to overestimate the increase in overall retirement savings that would result from an expanded CPP. To find out if increases in mandatory contributions tend to displace voluntary savings, in RRSPs and an expanded Canada Pension Plan we provide a preliminary investigation of readily available historical data from the Canada Revenue Agency (CRA) on contributions to the Canada Pension Plan (CPP) and also to Registered Retirement Savings Plans (RRSPs), an important voluntary retirement savings vehicle in Canada. The period examined is 1993 to 2008, which includes several increases to the CPP contribution rate. Indeed, the CPP contribution rate nearly doubled between 1993 and 2003. This preliminary investigation suggests that mandatory increases in CPP savings result in reduced voluntary savings in RRSPs. If the preliminary analysis is validated by more detailed microanalysis, the discussion about the efficacy of increasing the CPP contribution rate for all Canadian workers should then include the costs of reduced RRSP savings compared to increased CPP savings. Other aspects of this trade-off, such as the comparative benefits of the CPP (defined benefit in retirement) compared to the benefits of RRSPs (flexibility and choice), also need to be assessed and discussed. The key to a successful system for providing retirement income through savings is a set of rules that allow for an optimal mix of savings for different people in different stages of their lives and with different preferences. There may be benefits to a compulsory expansion of the CPP. However, these benefits need to be weighed against the costs, which, as our analysis shows, likely include a reduction in voluntary RRSP savings. "The Financial Well-Being of Elderly People in Europe and the Redistributive Effects of Minimum Pension Schemes"
The Americans with Disabilities Act of 1990, ratified 23 years ago last month, is based on what was then a radical idea: that the physical and social environment people with disabilities face is as much responsible for their inability to fully integrate into society as their health-based impairments. But despite the improvements mandated by the ADA, the employment rate of working-age Americans with disabilities (aged 16-64) hit an all-time low of 14.5 percent in March 2012 (latest number available) — by comparison, it was 28.6 percent in March 1990 and 18.7 percent in March 2007, just before the Great Recession. Congress must recognize that this precipitous drop in employment is not the result of an increase in the severity of work limitations or of growing discrimination in our society. Rather, it is the unintended consequence of their failure to reform Social Security Disability Insurance — a program that discourages Americans with disabilities from working. The Christian Science Monitor reports on the fading Disability Insurance trust fund, and what is driving DI’s financial problems. As a disabled man, Matthew Rini of Harwood Heights, Ill., struggles to survive on sporadic earnings as a tour guide in Chicago and about $400 a month from the Social Security Disability Insurance(SSDI) program. His live-in companion, Maria, helps with household expenses. But even as Mr. Rini grapples with a deteriorating ability to work, he and millions of others face another potential woe: a looming insolvency of the SSDI trust fund, whose reserves are set to run dry in three years. Unless Congress acts, disability benefits would then be cut 20 percent. For some SSDI recipients, the result could be grim, requiring cutbacks in food purchases or other daily necessities. But as the 2016 deadline draws near, remedies for fixing SSDI are stirring up debate, complicating the path toward a resolution and highlighting the polarized views among Americans about government-run social programs. Politically, it's a trial run for the debate over shoring up Social Security, whose combined funds are expected to be depleted in 2033. Given the importance of DI benefits to so many and the short time until the program becomes insolvent, you’d guess that many Members of Congress would have proposed plans to fix the program. Guess again: while some outside analysts have ideas on how to reform DI, Congress is mostly silent. Has the Fundamental Federal Budgetary Challenge Been Addressed? The deficit has fallen faster than we expected a few years ago, but the fundamental federal budgetary challenge remains. What are the Lessons for the US? The Retirement Security Project and the AARP Public Policy Institute invite you to a discussion of what we might learn from retirement savings systems in Australia and Asia. Australia's mandatory Superannuation Guarantee requires its citizens to save at least 9 percent of their income towards retirement. In many Asian nations, economic growth has spurred reexamination of pension systems to meet the needs of rapidly evolving societies. * Whether a mandatory retirement savings plan like Australia's would be more effective the current US voluntary system with automatic enrollment and automatic escalation. * How Asian nations have restructured their pension systems to deal with legacy costs and their experience with establishing retirement savings plans. * What Americans can learn from the way Australia's industry funds use both employer and employee representatives to shape investment choices. * David Harris, Managing Director, Tor Financial Consulting, Ltd.